3 things that should scare you that you might not know about - A Digital Marketing Agency | IIAS - International Internet Advertising Services Inc.
With Halloween just around the corner, we thought it was timely to share a few of the scariest things we’ve heard about in the past few months. BOO! There are very valid reasons for wanting your business to have a high profile online – showing up in lots of different listings and directories, especially those that show positive reviews of your products or services. Unfortunately, some of the most popular are run by extortionists. This two minute video on YouTube reveals some tidbits about Yelp, and a Google search for “yelp scam” will give you all the info you need to stay far, far away from this company. Google, Facebook, and many other platforms and websites also have a habit of creating pages or listings in a business’s name without contacting them first. The pages get set up and people can leave ratings and comments without you ever knowing about it. All business owners need to go on the offensive by regularly searching for their own company and seeing what’s out there. If it’s not good, we can advise you on what to do about it. Werewolves appear to be normal human beings, right up until they turn into terrifying wolf-like creatures. So too are some of the seemingly wonderful gadgets that appear to make our lives easier and safer. Take, for instance, a baby monitor. It’s great to be able to see and hear the baby when you’re in another part of the house – except, your monitor also let’s other people see and hear your baby, and track when you are and are not in your baby’s room. 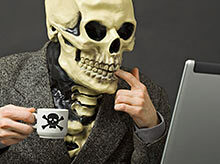 A recent article from PC Magazine provides some gory details. Any device that uses wireless technology is susceptible, including your car. Security on the Internet has made great strides, although as regular news casts will tell you, no one is truly safe from hackers. With the recent surge in devices that utilize web, and particularly wireless, technologies, security has not been as big a consideration as it should have been. 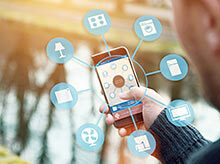 If you can control a gadget without flipping a switch on the side of it, or can get sound or video without being connected by a cord, the device is using wireless technology. Do thorough research, and bring in a tech security expert technician if need be, to set up appropriate security mechanisms. A September CBC News report that looked at reports from the Canadian Privacy Commissioner and a collaboration of enforcement organizations in 21 countries including Canada, revealed some shocking information that should scare any parent. The majority of apps and websites collect personal information including name, birth date, location, phone number, email address, and photographs. Much of that information is available to other users – children and predators alike – and is also sold or traded with third-parties. Popular sites including taylorswift.com, justinbiebermusic.com, and gurl.com, were some of the worst offenders. CBC also found a blog post from the Office of the Canadian Privacy Commission criticising Santasvillage.ca, for getting children to provide their full names and email addresses in order to be added to Santa’s “nice” list. So, what’s a parent to do? Well, particularly if you have younger children, it’s not enough to just look at the site or topic. Your kids need to tell you about the sites or apps they want to use before they join or download them, so you can review what information is requested; and teach kids never to enter personal information without coming to you first.